Baby Kale Breakfast Salad with Soft Boiled Eggs and Maple Bacon Vinaigrette. Roasted Turkey Potato Chip BLAT. Loaded Skillet Toasted Green Beans. Bacon Cinnamon Rolls. Uh huh. Killer Spinach Salads with Hot Bacon Dressing. Spinach and Red Pepper Bacon Wrapped Eggs. Creamy Caramelized Leek Soup with Maple Glazed Bacon. 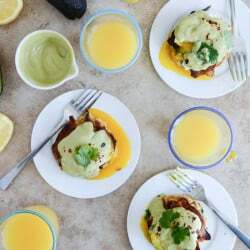 Sweet Corn Cake Eggs Benedict with Avocado Hollandaise. Warm Brussels Caesar with Bacon Ciabatta Croutons. White Pizza with Spinach and Bacon. Fontina and White Cheddar Skillet Brussels Bacon Mac.